I know what you are thinking, two products to clean your face- Jamie are you kidding? Although it may sound a bit unnecessary in your beauty routine, I do promise that it contains some amazing benefits that will make you change your mind. A solid beauty routine originating back in Japan, the two step double-cleansing method is seriously becoming a skincare phenomenon nowadays. Here are three reasons why you NEED to try a double cleanse. Reason No. One: On a daily basis our faces our exposed some serious dirt, grime, pollution and makeup. Removing those impurities from the skin is a step that sometimes a once over cleanse cannot remove completely. Have you ever washed your face, went to tone your skin and realized that there still is some dirt and makeup on your face? I know I have been astounded more than a few times by it. 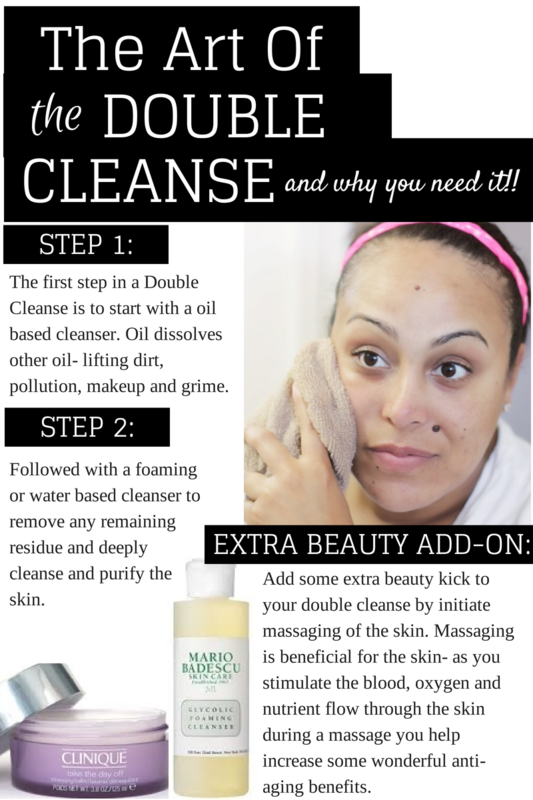 So we enter the double cleanse step- this helps ensure the dirt, pollution and grime is removed from the day all without stripping the skin or leaving it tight. Double cleansing helps remove two different types of dirt: oil based dirt and water based dirt. Oil based dirt– mainly makeup and excess oxidized sebum. Water based dirt– comprised of things like dirt, sweat and daily pollution. When it comes to a double cleanse it is like chemistry with the key theory of oil and water don’t mix. Oil dissolves other oil, therefore starting a solid double cleanse with an oil based product. Followed with a foaming or water based cleanser to remove any remaining residue and deeply cleanse and purify the skin. Reason No. Two: Deep cleansing is the foundation of great skin. The double cleanse helps promote healthy, balanced and properly cleanser skin. 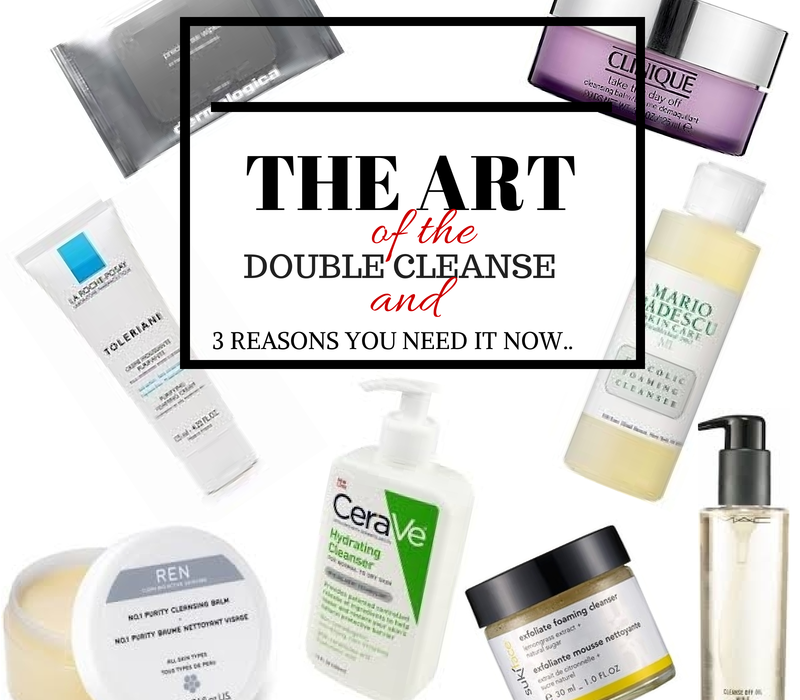 Many top facialists worldwide, often tend to recommend the double cleanse method. After a week of double cleansing- skin will be ph normalized and looking about 5 times better. I don’t know about you, but I want beautiful skin. A double cleanse prepares the skin for more products- hello serums and helps the treatments themselves soak into the skin for maximum effectiveness. And a extra beauty bonus- the double cleanser will not aggravate or clog pores- score! The end results you are left with beautiful, clear, radiant skin. Reason No. Three: Skin care products after a while stop working. I often tend to try out tons of products and change things up all the time- never getting stuck to one skin care routine forever. Have you ever used a regimen and noticed all of a sudden it stopped working? Skin changes depending on the weather, time of year, hormones stress, etc… so needless to say sometimes a small tweak is what the skin needs. A double cleanse helps regulate the skin regardless of the time of year, stress or hormones, and allows treatments to be fully absorbed in a regimen. Double cleansing can help initiate massaging of the skin. Massaging is beneficial for the skin- as you stimulate the blood, oxygen and nutrient flow through the skin during a massage you help increase some wonderful anti-aging benefits. Who should try a double cleanse? Anyone who wears makeup, sunscreen or has oily skin. I tend to fall into that category for sure since I wear daily makeup aka. war paint; however during season changes- I tend to have slightly oily skin. So a double cleanse for me is becoming a crucial part of my regimen. My skin is becoming calmer and more refreshed. After a while of double cleansing I am happy to report that my skin is not dry or tight, and while I sometimes still have some hormonal breakouts rising, I am happy to report my skin is no longer red or sensitive in certain areas. I dont know about you but I call that a score. 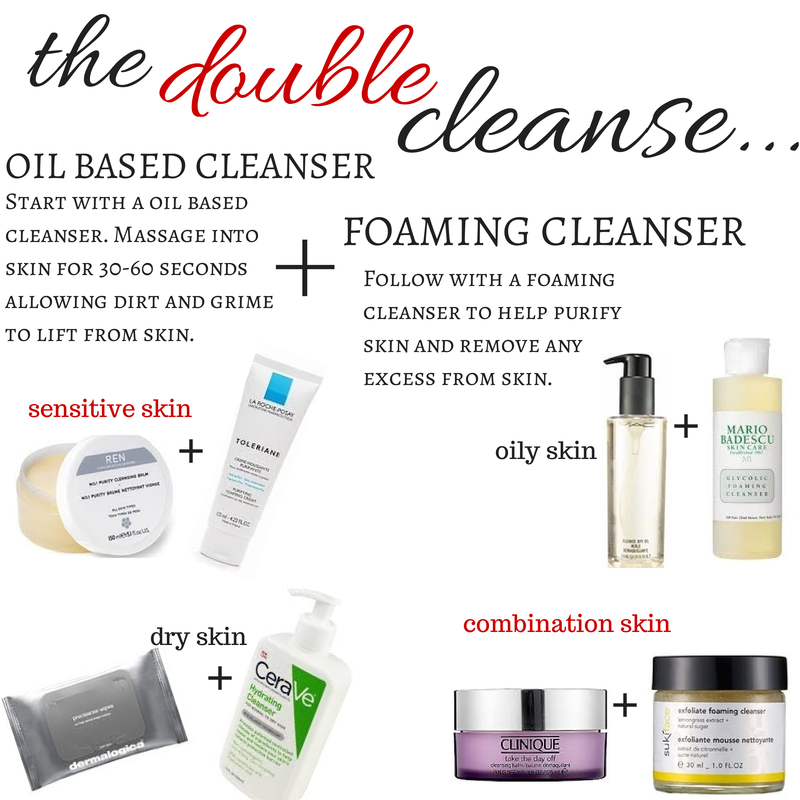 A double cleanse for sure is a skincare staple that will be staying in my regimen- I think I am in LOVE! Have you tried a double cleanse? Do you add massage into your skincare washing routine? The New Thing: Hauling Madness….